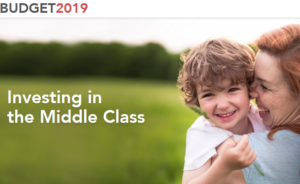 The following is a quick analysis of science-related highlights from the proposed 2019 Federal Budget, entitled “Investing in the Middle Class”, prepared by the CAP’s Science Policy Committee. Throughout the year, CAP will continue to monitor government policy that could affect physics in Canada. The full budget can be found at https://www.budget.gc.ca/2019/home-accueil-en.html in English and https://www.budget.gc.ca/2019/home-accueil-fr.html in French. In 2018, the Government provided very large new investments in fundamental science across a broad range of areas; in fact, the 2018 budget actually exceeded the recommendation of the Fundamental Science Review (i.e. Naylor report) regarding CFI funding. Despite the fact that the 2019 budget does not introduce significant new science funding, there are a few areas in which the 2019 builds on the 2018 budget to make further progress in implementing some more of the Fundamental Science Review’s recommendations. To move towards achieving its goal of greater diversity among the tri-council research funding recipients, including improved support for women, underrepresented groups (including indigenous) and early career researchers, the Government is investing $6 million over five years ($0.5 million ongoing) for surveys to collect improved data on researchers, as well as $15 million over five years for programs addressing improved equality and diversity in academia at post-secondary institutions. The CAP welcomes renewal of TRIUMF’s five-year funding. The funding provided in the budget, at a total of $292.7 million, notably less than the $320M that the CAP requested for TRIUMF in the pre-budget consultation. Nonetheless, TRIUMF reports, “this funding represents the largest single investment in TRIUMF to date,” enabling it to bolster its portfolio of activities. The Review recommended that more rigorous reviews be undertaken before such agencies are renewed. Thus, it recommended a new body be mandated not only to review proposals to create new third-party delivery organizations, but also to assess ongoing activities of all existing third-party organizations that receive federal support. Since the “Strategic Science Fund” is not yet in place, Budget 2019 proposes to provide several non-profit organizations with renewed funding directly through this budget. These includes Let’s Talk Science and several health research organizations: the Stem Cell Network, Brain Canada Foundation, Terry Fox Research Institute, Ovarian Cancer Canada, and Genome Canada. Budget 2019 proposes to provide $114 million over five years, starting in 2019–20, with $26.5 million per year ongoing, to the federal granting councils—NSERC, CIHR, SSHRC —to create 500 more master’s, and 167 more three-year doctoral, Canada Graduate Scholarships. Budget 2019 proposes to provide a total of $37.4 million over five years, starting in 2019–20, and $8.6 million per year ongoing, to the federal granting councils, to expand parental leave coverage from six months to 12 months for students and postdoctoral fellows who receive granting council funding. Further, there are a number of measures to make student loans more affordable, such as lower interest rates, a new interest-free grace period after graduation, and specific accommodations for students with disabilities or those in vulnerable financial situations. EDI is a theme throughout the budget, and there are a few science-related initiatives that are identified as promoting EDI. These include the parental leave provision for student researchers mentioned above; funding for CanCode, which teaches young people digital coding skills, and focuses on underrepresented groups in STEM, such as girls and Indigenous youth; and Let’s Talk Science, which engages youth in hands-on STEM activities and learning programs, and particularly helps girls take an interest in STEM from an early age. To give even more young people opportunities to get the digital skills that will help them succeed, Budget 2019 proposes to provide $60 million over two years, starting in 2019–20, to support CanCode’s ongoing work and help one million more young Canadians gain new digital skills. To support the next generation of research and researchers, the Government announced in Budget 2018 the largest ever increase in funding for fundamental research through Canada’s granting councils—more than $1.7 billion over five years. Since 2016, the Government has committed more than $9.4 billion to support Canadian scientists and researchers, including significant investments in the cutting-edge equipment needed to make scientific breakthroughs and drive innovation. Budget 2019 builds on these earlier investments in science excellence, delivering economic benefits while making Canada and the world a safer, healthier, better place to live. Stem Cell Network:Stem cell research—pioneered by two Canadians in the 1960s—holds great promise for new therapies and medical treatments for respiratory and heart diseases, spinal cord injury, cancer, and many other diseases and disorders. The Stem Cell Network is a national not-for-profit organization that helps translate stem cell research into clinical applications and commercial products. To support this important work and foster Canada’s leadership in stem cell research, Budget 2019 proposes to provide the Stem Cell Network with renewed funding of $18 million over three years, starting in 2019–20. Brain Canada Foundation:The Brain Canada Foundation is a national charitable organization that raises funds to foster advances in neuroscience discovery research, with the aim of improving health care for people affected by neurological injury and disease. To help the medical community better understand the brain and brain health, Budget 2019 proposes to provide the Brain Canada Foundation’s Canada Brain Research Fund with up to $40 million over two years, starting in 2020–21. This investment will be matched by funds raised from other non-government partners of the Brain Canada Foundation. Terry Fox Research Institute:The Terry Fox Research Institute manages the cancer research investments of the Terry Fox Foundation. Budget 2019 proposes to provide the Terry Fox Research Institute with up to $150 million over five years, starting in 2019–20, to help establish a national Marathon of Hope Cancer Centres Network. The Institute would seek matching funding through a combination of its own resources and contributions that it would seek from other organizations, including hospital and research foundations. Ovarian Cancer Canada:Ovarian Cancer Canada supports women living with the disease and their families, raises awareness and funds research. Budget 2019 proposes to provide Ovarian Cancer Canada with $10 million over five years beginning in 2019–20 to help address existing gaps in knowledge about effective prevention, screening, and treatment options for ovarian cancer. Genome Canada:The insights derived from genomics—the study of the entire genetic information of living things encoded in their DNA and related molecules and proteins—hold the potential for breakthroughs that can improve the lives of Canadians and drive innovation and economic growth. Genome Canada is a not-for-profit organization dedicated to advancing genomics science and technology in order to create economic and social benefits for Canadians. To support Genome Canada’s operations, Budget 2019 proposes to provide Genome Canada with $100.5 million over five years, starting in 2020–21. This investment will also enable Genome Canada to launch new large-scale research competitions and projects, in collaboration with external partners, ensuring that Canada’s research community continues to have access to the resources needed to make transformative scientific breakthroughs and translate these discoveries into real-world applications. Let’s Talk Science:Science, technology, engineering and math (STEM) are not just things we study in school—together, they are transforming all aspects of our lives, and redefining the skills and knowledge people need to succeed in a changing world. Let’s Talk Science engages youth in hands-on STEM activities and learning programs, such as science experiments, helping youth develop critical thinking skills and opening up doors to future study and work in these fields. It also helps ensure more girls—and other groups that are underrepresented in STEM—gain and maintain interest in STEM from an early age. Budget 2019 proposes to provide Let’s Talk Science with $10 million over two years, starting in 2020–21, to support this important work. Budget 2019 proposes to provide TRIUMF with $195.9 million over five years, starting in 2020–21, to build on its strong track record of achievements. Combined with an additional $96.8 million from the existing resources of the National Research Council, federal support for TRIUMF will total $292.7 million over this five-year period.